We’re looking for 20 children (aged 12 – 36 months) and their grown-ups to embark on an exciting eight month journey with us. Become Exhibition Explorers and discover new ways of enjoying galleries and museums together. A great way to introduce your child to museums and galleries, enjoy cultural days out as a family, and create keepsakes of your child’s early experiences. Children must be aged 12-36 months when the series begins. Meet at the Shipley Art Gallery once a month for a fun, facilitated session inspired by the exhibitions. Get up close to the artworks, make new creations, and explore the gallery through songs, stories, and imaginative play. Pick up ideas for helping your child connect with exhibitions, which you’ll be able to do easily and confidently when you visit museums and galleries as a family. 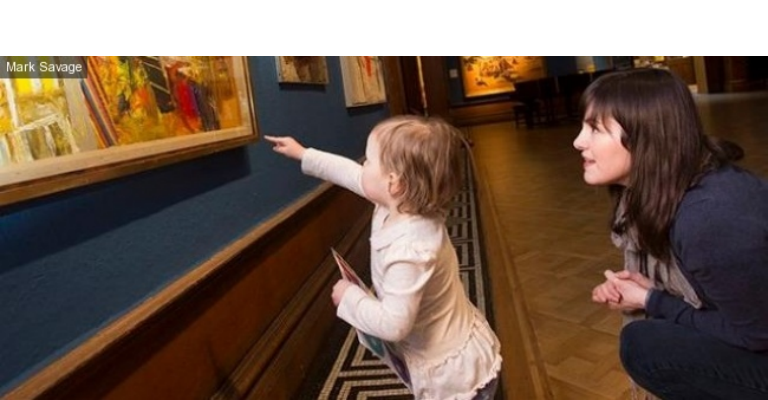 Between each session at the Shipley, visit at least one museum or gallery with your child. We’ll give you a special kit for you and your child to record the places you visit. Enjoy storytime with a difference, as we share the Family Adventures everyone’s been on. Find out what’s out there for families and get ideas for your next Family Adventure. Have your Family Adventures added to our blog.This will form a bank of cultural experiences that grows alongside the children, which you can dip into for new ideas of museums and galleries to visit as a family. At the end of the project you’ll get a folder of all your Family Adventures records – a lovely keepsake of your child’s early cultural experiences!